Girl Your Amazing , Just The Way You Are. 001 Finely getting over this flu this is probably the first day i actually got dressed and went out of the house! I might invest on some more different styles of tights etc, i think leggings are so boring and the easy option. I have no work tonight or tomorrow so I’m just about to start getting ready for a very drunk night out with the girls. Thank you for all you lovely comments, most about my hair – no it didn’t take me long to get this colour really its just shampoo ;). This week i also sorted out some university’s, ill talk more about that in the week. Hope you all have a great weekend, i no I’m going to :). 002 I did go into Topshop to buy something warm and cosy and they had nothing i had saw online, i debating on whether to buy online or wait till next week to go to the bigger store, that option seems better, since ill get my student discount that “haha”. Stinge. Oh how i would love to work in Topshop! 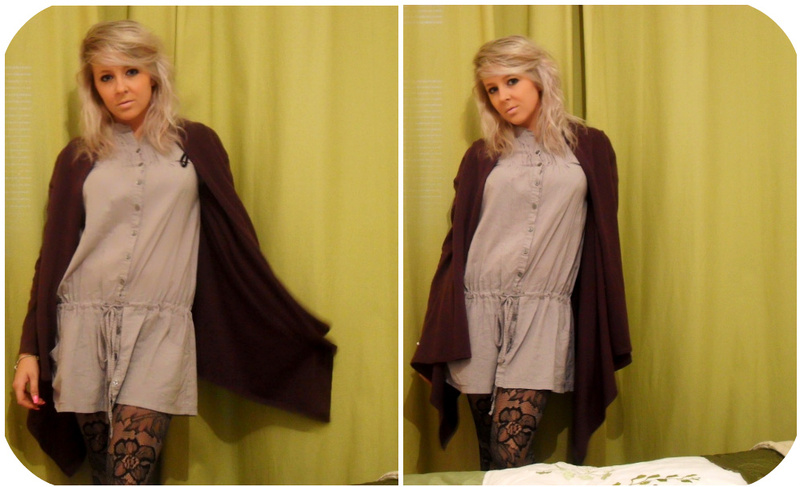 I like the Cardigan. It's really a nice design. Perfect as part your outfit! I love your tights!! I bought ones in H&M last week. Finally I’d like to say that I LOVE Thopshop but I have the same problem… when I like something from the web It isn’t in the shop. I have bought in the web and I’m Spanish, they work well!! I love your blog so… I FOLLOW U!! You are very cute! I love your style. And very much so envy that hair of yours…. Love this look, especially the tights ! I really like the patterned tights and the playsuit!